Whenever you throw away something, say an orange peel, you have decided that it is useless to you. It is waste, and you are better off without it. But have you thought if these wastes can be useful in other ways or perhaps to others? (Tip: An orange peel can be dried for making Chinese desserts.) Even when you flush the toilet and want nothing to do with the disgusting stuff that disappears down the toilet, have you thought of how it might be cherished? Here are a few lessons from animals on how to reuse waste. There are many ways in which nature turns waste into treasures. In nature, everything is a resource to someone, and nothing is wasted. In fact, nature does not create waste. 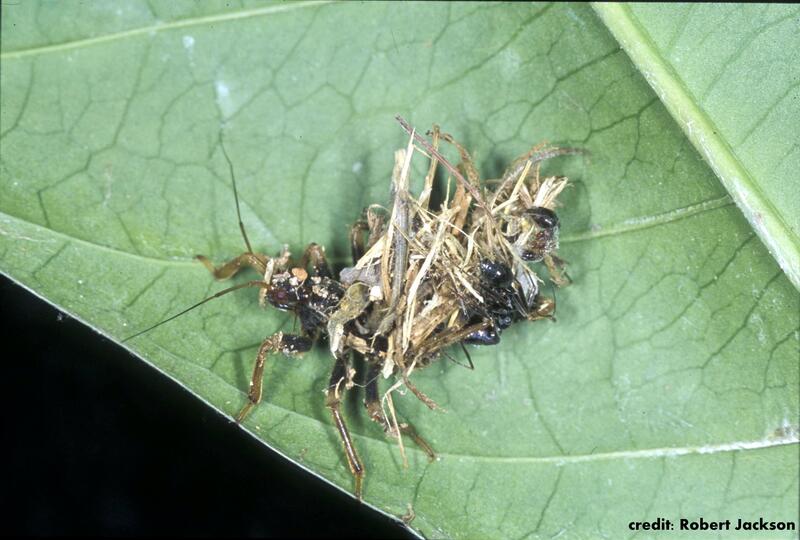 The next time you discard dinner scraps, think of assassin bugs from Africa. These bugs kill and eat their insect prey but instead of disposing the scraps, they wear them for protection. Assassin bugs sneak up to their prey, and stab it with their proboscis—a slender mouthpart that looks and works like a syringe. Paralyzing toxins are injected into the prey which is then sucked dry of its liquefied contents. Many assassin bugs sport camouflage colors, and some even apply sand to improve their ability to hide. In West Africa, the nymphs of assassin bugs Paredocla and Acanthaspis sulcipes mask themselves with the most unlikely items – the prey that they have sucked empty. After killing an ant or termite, instead of throwing away the carcasses, the assassin bug pins the crumpled ant shell with its proboscis, turns its head and places the ant on its back. Sticky hairs on the bug’s back glue the carcass in place. One was found to carry 222 ants! That’s a really grisly backpack. If the backpacks are lost, the bugs “will kill ants even if not hungry and, without feeding on them, put them on its back,” says animal behaviour scientist Robert Jackson from the University of Canterbury. A backpack of ants and termites can save the bug’s life. When scientists pitted bugs with and without backpacks against predators – geckos, centipedes and spiders – they found that bugs with backpacks suffered almost no attacks by geckos and centipedes, while bugs without backpacks were quickly killed. It seemed geckos and centipedes failed to recognize an ant-covered assassin bug as food. On the other hand, spiders did attack bugs with backpacks, but not successfully. Often they would latch onto the backpack instead of the bug. The bug would release their backpack and escape. When army ants march across the Amazon jungle, animals flee from the marauding swarm. Many insects take to the sky to save their lives, only to be snapped up by birds. Certain birds follow army ant swarms to feed on the escaping insects. As the birds gorge, they poo too. Spots of white bird poop soon decorate the marching ground of the army ants. Making the most of this waste are butterflies. Some butterflies (Ithomiines and skippers) flutter along army ants trails. They hover above the swarm and swoop down quickly on the bird poop. The butterflies uncoil their tongues into the white poop and drink. Bird poop is not nectar, but it is rich in nitrogen and sodium – elements that butterflies need to produce eggs. Butterflies also visit salt licks and other animal droppings for extra minerals, but army ant swarms and their birds put on a banquet that the butterflies can’t resist. Moths, like butterflies, also produce more eggs if they get more nitrogen. For the Trisyntopa neossophila moth in Australia though, the adults do not eat. So these moths must get all their nitrogen resources while they are caterpillars. They, too, eat from the poop of a bird – the hooded parrots in Northern Territory, Australia. Hooded parrots make their nests in termite mounds, where they lay a few snug eggs. On the wall of the termite mound, pairs of T. neossophila moth adults walk in zig-zag patterns. The moths are courting, and will mate and lay eggs in the same chamber. T. neossophila caterpillars hatch about ten days after the first parrot chick hatches. By then, the parrot chicks have created quite a mess! The caterpillars have a feast of waste waiting for them. Moth caterpillars grow fast on the parrot chick poop. Within 25 days, the caterpillars have grown 30-times in weight and 50-times in length. As they develop, the caterpillars weave silken mats and hide underneath. When they are hungry and the chicks delivers some warm poop, the caterpillars pop their heads out to munch. Soon after, the caterpillars pupate inside the nest, and emerge as adults to fly out of the parrot nest. 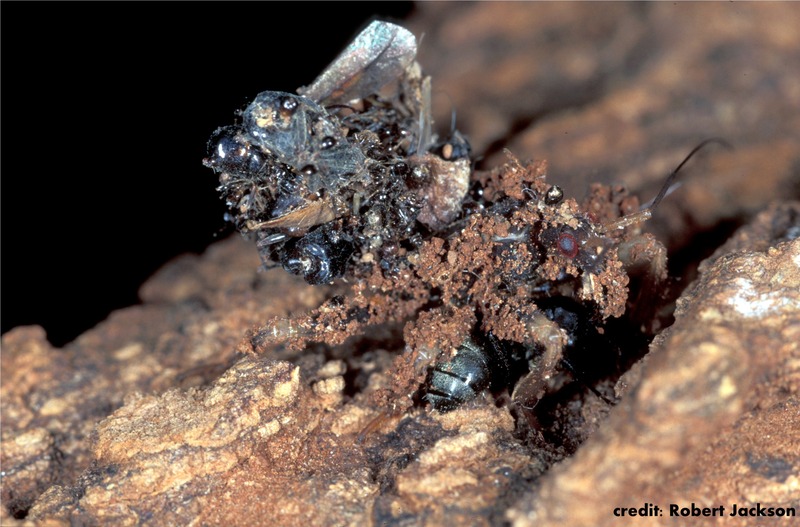 Compared to the butterflies that drink from bird poop near the destruction of army ants, the T. neossophila caterpillars seem to enjoy a cosy existence in the parrots nest. However, T. neossophila have evolved very closely with the hooded parrots and their fates are tied. Now as the hood parrots numbers decline, so do the moths. A mother koala’s greatest gift to her joey is not her milk, but her poo, or feces. Not just any feces, but a special type of feces called pap, and joeys love it. Without pap, joeys cannot digest eucalyptus leaves. Eucalyptus leaves contain lots of tannins. Tannins make plants difficult to digest for most animals. Koalas though, have the right gut for tannins. Chewed-up eucalyptus leaves are digested in the koala’s cecum, where a diverse and abundant community of microbes lives, including enterobacteria that can break down tannin products. Koalas need these enterobacteria to break down the tannins in eucalyptus leaves. But how do these enterobacteria get into a koala’s cecum in the first place? Joeys are not born with the enterobacteria, but acquire them from the mother’s cecum. And that means the joeys have to swallow some pretty nasty stuff. In its first six months, the joey has been feeding solely on its mother’s milk but it will soon have to wean and switch to eucalyptus leaves. At this age, a joey peeps out into the world from its mother’s pouch, and leans towards its mother’s cloaca, the opening from which a koala gives birth, urinates and defecates. The joey starts to nuzzle the cloaca. A sample of pap collected from a (dead) koala. The pap is kept chilled until given to an orphaned joey. 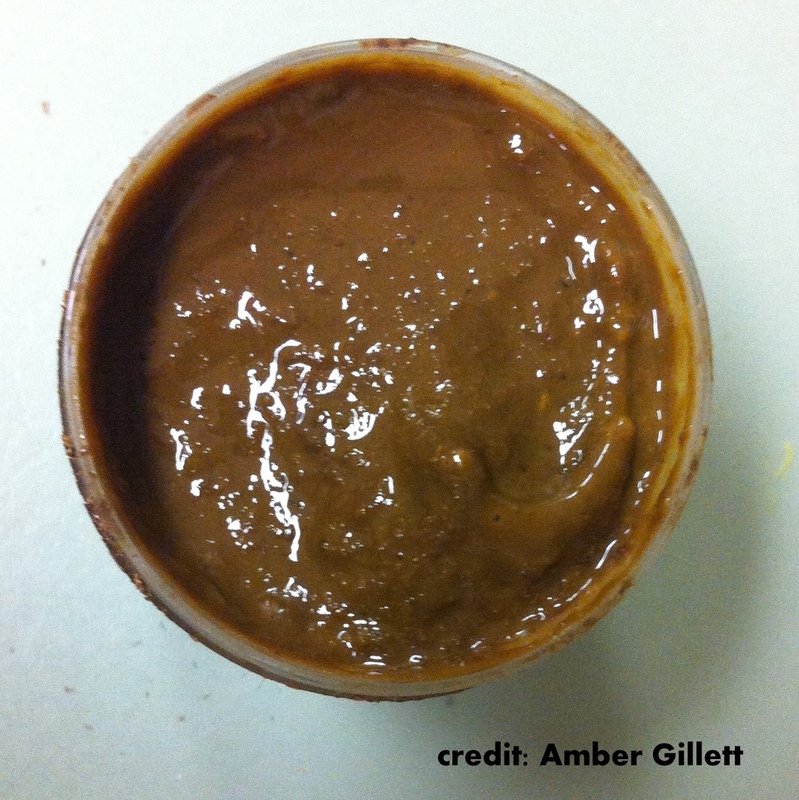 Pap is a bacterial soup that gives the joey its first dose of vital bacteria to populate its cecum. A few weeks after its first pap-feeding, the joey tries eucalyptus leaves. Armed with a community of tannin-digesting bacteria in its cecum, the joey begins a life-long diet of eucalyptus leaves. Pap smells, but the odor is tolerable says Amber, it “might even have a sort of eucalyptus smell.” Still, you would not want to eat it. Leave that to the joeys. On the seabed, two hermit crabs are facing off over shells. Both are pushing the other with their claws when suddenly, one manages to grip its rival’s shell. It shakes and rocks its rival hard, attempting to weaken the occupant’s resolve. The aggression pays off, the rival crawls out of its shell, exposing a naked, spiral-shaped soft belly, and waits by the side. The winner examines the shell and, apparently satisfied, leaves its shell and moves into its prize. The loser deftly slips into the winner’s old shell – the shell does not fit right, but it beats exposing your naked belly in the open waters. Across the seas and coasts, hundreds of hermit crab species are busy fighting and exchanging shells. “They are always investigating and looking for new shells, checking shells both empty and occupied,” says Alexander Turra from the University of Sao Paulo. Unique among crustaceans for having an exposed bellies (abdomens – check), hermit crabs protect their soft bodies by occupying empty shells of that once belonged to snails. They carry these mobile shelters with them until they find a better shell, which is usually a bigger and undamaged shell. For hermit crabs that live in turbulent waters, heavy shells also provide stability. Hermit crabs suffer if they fail to get better shells. Crabs stops growing in a tight shell, and females can fit few eggs into small shells. Predators could breach damaged shells, and leaky shells cannot hold water that would otherwise keep hermit crabs moist when the tides recede. Because hermit crabs only use shells left by dead snails, scientists think that shell numbers limit hermit crab population. Shells can disappear quickly in areas where soil erosion carries lots of sediment to the seas and bury the shells. In areas where snails are dying due to environmental impacts caused by humans, hermit crabs struggle to find shells. Some hermit crabs have turned to using plastic found in marine waste to replace shells—once again putting waste to good use. Brandt, M., and Mahsberg, D. (2002). Bugs with a backpack: the function of nymphal camouflage in the West African assassin bugs Paredocla andAcanthaspis spp. Animal Behaviour 63, 277–284. Jackson, R.R., and Pollard, S.D. (2007). Bugs with backpacks deter vision-guided predation by jumping spiders. Journal of Zoology 273, 358–363. Cooney, S.J.N., Olsen, P.D., and Garnett, S.T. (2009). Ecology of the coprophagous moth Trisyntopa neossophila Edwards (Lepidoptera: Oecophoridae). 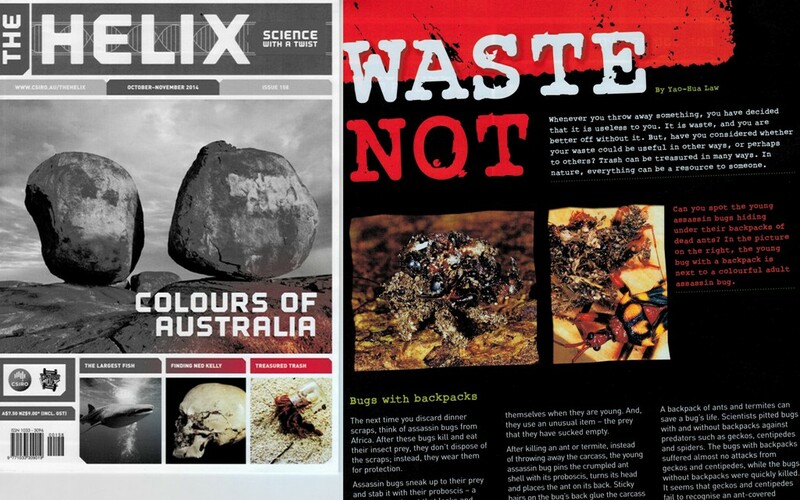 Australian Journal of Entomology 48, 97–101. Ray, T., and Andrews, C. (1980). 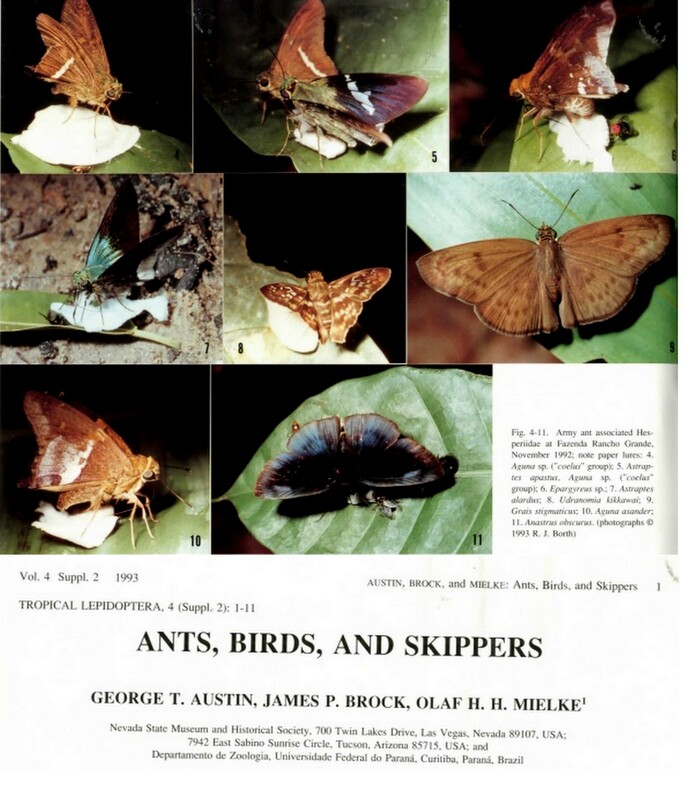 Antbutterflies – Butterflies that follow army ants to feed on antbird droppings. Science 210, 1147–1148. Austin, G.T., Brock J.P., and Mielke O.H.H. (1993). Ants, birds, and skippers. Tropical Lepidoptera 4 (Supp.2), 1-11. This entry was posted in Science news report and tagged Africa, army ants, assassin bugs, butterflies, hermit crabs, hooded parrots, insects, koala, skippers, The Helix. Bookmark the permalink.